Originally from Nice, south of France, Marie worked at different marketing jobs for French Riviera large companies. But her wedding changed her.. professional life. She decided to make bow ties by herself for her dad and future husband. At the ceremony everybody was asking where the bow ties were bought. She then decided to create her own company and lauched "Marie Preville Bow Ties" in France, with some success. 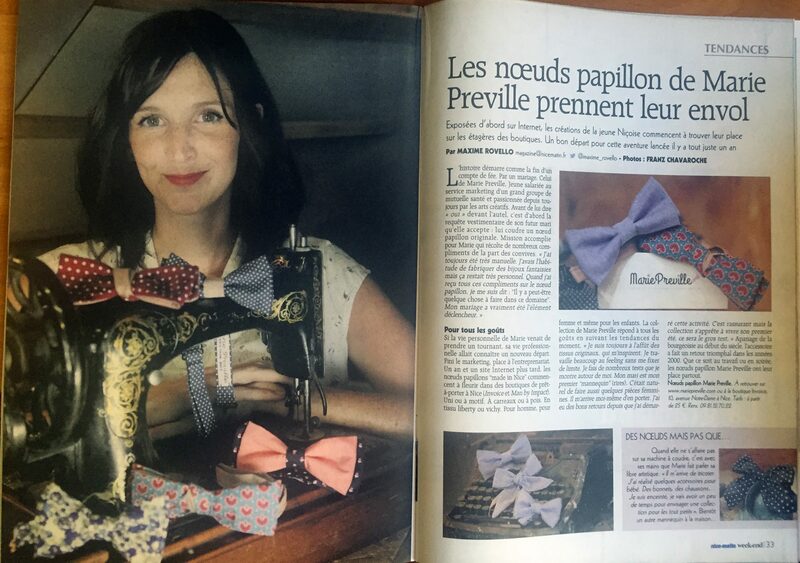 Only few months after lauching her bow ties in France, she was already in the magazines! Her husband persued his career in the United States and family moved in Las Vegas in January 2017. Marie decided to launch her products in the U.S. market. Marie with her grandmother sewing machine, that is roughly 100 years old. Don't worry, Marie doesn't work with this machine! Marie can create the bow tie you dreamed of. Fancy colors ? Striped, patterned or floral ? Everything is possible ! Let us know about your idea by completing the online form and we'll find the fabrics and create it for you!